This rear diffuser features and FRP center and carbon surround. Vivid Racing chooses Wald International aerodynamic parts for their top class products designed to improve the appearance and performance of your vehicle. The Quality, fitment and design of Wald are unmatched in the industry. Constructed of Carbon Fiber, Wald Aero kits are both light weight and durable. Wald International designs its products to compliment the vehicles existing lines, adding unique style with understated class. All Wald products are direct fitment designed with specific vehicles in mind. Wald pieces not only add style to your vehicle but also increase efficiency by reducing drag. Increased aerodynamics keep vehicle stable at high speeds and provide better handling characteristics. 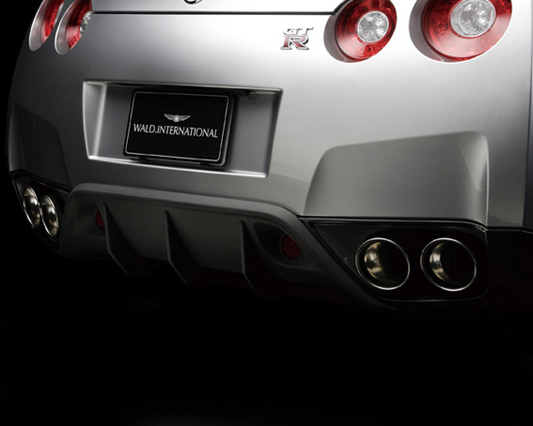 The Nissan GT-R is the pinnacle of high performance technology and efficiency. Still, sacrifices have been made to make the GT-R more practical for the average driver, daily driven uses, and ease of production. 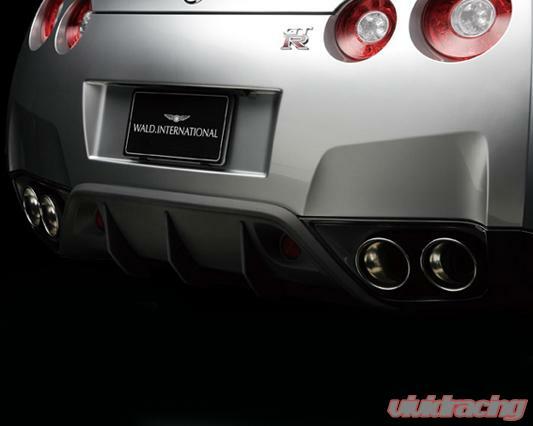 That is why Wald International has stepped up and delivered aerodynamic components for the Nissan GT-R. These components allow Nissan GT-R owners to customize their vehicle and improve the aerodynamics to better suit vehicle as powerful as the GT-R. The challenge for every tuner is to improve on the production model without ruining the original design. That is what tuning company Wald International did with the Nissan GT-R. Their Black Bison appearance package makes the Nissan look more aggressive without making it look gaudy. Wald International specifically designs each panel to compliment the existing lines of the GT-R, no universal parts are used. Aero panels give the owner an opportunity to individualize their vehicle to their specific taste while at the same time improving aerodynamics. All panels are constructed from durable carbon fiber. Commonly found on Indy and Formula 1 cars, rear diffusers are used to increase a vehicles aerodynamics by decelerating the turbulent air underneath the vehicle as it passes under the car. The reduction of this air turbulence decreases drag and increases stability at high speeds. Besides its functional increase in performance, rear diffusers give the rear of your vehicle a unique accent.